The anterior cruciate ligament (ACL) is one of the major stabilizing ligaments in the knee. It is a strong rope-like structure located in the center of the knee, running from the femur to the tibia. The ACL is one of the four major ligaments of the knee that connects the femur (thighbone) to the tibia (shinbone) and helps stabilize your knee joint. It prevents excessive forward movement of the lower leg bone (tibia) in relation to the thighbone (femur) as well as limits rotational movements of the knee. When this ligament tears, unfortunately, it does not heal, and often leads to the feeling of instability in the knee. A tear in this ligament can make you feel as though your knees will not allow you to move or even hold you up. When you injure your ACL, you may hear a loud "pop" sound and feel the knee buckle. Within a few hours after an ACL injury, your knee may swell due to bleeding from vessels within the torn ligament. You may notice that the knee feels unstable or seems to give way, especially when trying to change direction on the knee. An ACL injury can be diagnosed with a thorough physical examination of the knee and diagnostic tests such as X-rays, MRI scans and arthroscopy. X-rays may be needed to rule out any fractures. In addition, your doctor will often perform the Lachman's test to see if the ACL is intact. During a Lachman test, knees with a torn ACL may show an increased forward movement of the tibia and a soft or mushy endpoint compared to a healthy knee. A pivot shift test is another test to assess an ACL tear. During this test, if the ACL is torn, the tibia will move forward when the knee is completely straight and as the knee bends past 30°, the tibia shifts back into correct place in relation to the femur. 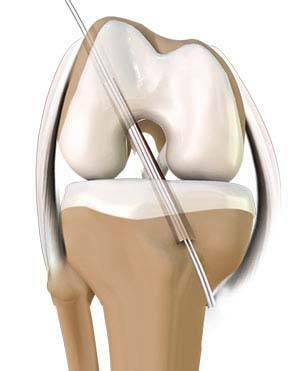 Anterior cruciate ligament reconstruction is a surgery to reconstruct the torn ligament of your knee with a tissue graft. The goal of ACL reconstruction surgery is to tighten your knee ligament and restore its stability. It is a commonly performed surgical procedure, and with recent advances in arthroscopic surgery, can be performed with minimal incisions and low complication rates. Following the surgery, rehabilitation begins immediately. A physical therapist will teach you specific exercises to strengthen your leg and restore knee movement.